Julie Adams & The Rhino Boys"I Don't Mind Walking"
"I Don't Mind Walking" is the second CD release from Mountain Stage diva Julie Adams and her backing band The Rhino Boys. For the last 14 years Julie Adams has been the featured vocalist for the internationally-syndicated "Mountain Stage" radio show, earning a reputation as one the country's premier interpreters of song. Each week listeners are exposed to her skillful vocal interpretation of often-classic and sometime-obscure songs of various styles -- always backed by the crack musicians in the show's house band. Last year's "Live" CD (Gadfly 232) was a collection of such performances. 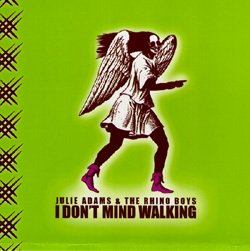 "I Don't Mind Walking" is the group's follow-up to its 1994 debut CD, which featured a dozen stunning Adams originals and took advantage of her unique ability to fuse pop, rock, and folk while throwing in the occasional nod to jazz. In addition to Adams, the group features ace guitarist Steve Hill and Mountain Stage percussionist Ammed Solomon. Former Mountain Stage bassist (and ex-Rhino Boy) John Kessler was also on hand for the sessions.